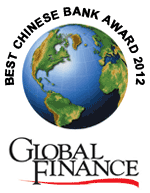 NEW YORK, September 24, 2012 – FOR IMMEDIATE RELEASE – Global Finance has announced its editor’s selections for the best banks and companies in China. The full list is below. A report and the list will appear in the November issue of the magazine. An award ceremony to honor the winners will be conducted in Beijing in early November 2012. Food and Beverages - Kweichow Moutai Co.
Oil and Gas - Kunlun Energy Co.